Took some quick snaps of the cushions we picked up on the weekend, all fluffed up with feather inserts. So cute! This pics are beautiful. Nice pics. Love the shot in the upper right corner best! But they are all adorable! Really, your choice of color and patterns amuse me. Lovely pillows...although I wish I was back in Hawaii with your Mum. Smile. I am in love with all all of those pillows!! I love your choice of colors and patterns. Love the pillows. Kicking myself for not being patient enough to wait it out for feather inserts. Love the throw pillow fabric AND those fabulous shades! Fantastic Kellie. 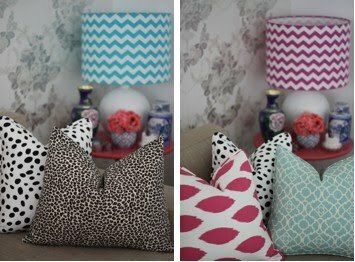 The choice of colours and patterns - both lampshades and cushions - are great. Love the green cushions in particular. Do you sell online? I adore all your lovely cushions and shades...what fun! Your talents are endless!!! Loved the first ones, really beutiful! My favorite tho is your ikat one in pink ...LOVE IT! Very pretty, and feather cushions are the way to go ~ I love fluffing them! Hi Kellie, I'm new to this whole blog world and have just found your site and it is amazing. I can't wait until your online store is up and running as I am coveting 2 of the turquoise zig zag lamps. They would match perfectly with my green and turquoise Bungalow cushions. Love everything that you do. 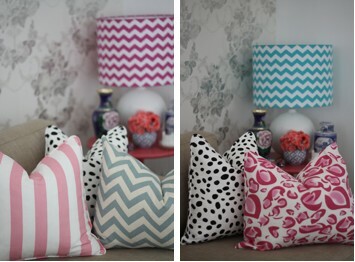 You have me convinced I need a chevron lamp shade... and now probably a pillow too! So colorful and pretty. I've been noticing more dalmation spot prints lately.